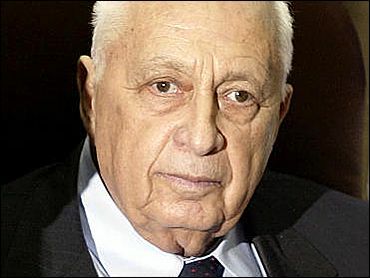 Prime Minister Ariel Sharon survived no-confidence votes in parliament Monday, a sign that his coalition is in no immediate danger of collapse, despite Cabinet approval of a divisive Gaza withdrawal plan a day earlier. However, Sunday's historic vote to pull out of Gaza by the end of 2005 left Sharon's coalition increasingly brittle and could lead to new political alliances, or even elections, in the coming months. "Without doubt, the political ground is shaking today," said legislator Avraham Burg of the moderate opposition Labor Party. By a 14-7 vote Sunday, the cabinet only approved a withdrawal in principle, delaying a vote on the removal of Israeli settlements until March. The wording of the decision was sufficiently vague to defer a major political crisis, but did not resolve the deep divisions within Sharon's center-right coalition over the dismantling of settlements. "This is one of the darkest decisions ever taken by an Israeli government," cabinet minister Effi Eitam of the pro-settler National Religious Party said. "It means expelling Jewish residents and setting up an Islamic terror state in Gaza." German Defense Minister Peter Struck, on a visit to Jerusalem, praised the Israeli Cabinet's decision Sunday to approve, in principle, Sharon's plan to withdraw from the Gaza Strip. "I congratulate you on the Cabinet decision," he told Sharon. "It is a brave decision and I know that the people of Israel stand behind you." Also Monday, two Palestinians, including a mentally disturbed man, were killed by Israeli troops. The army also said it was investigating the death of a paralyzed Palestinian man who was fatally shot by troops a day earlier. In other developments Monday, rockets were fired toward Israel from southern Lebanon, and a Lebanese security official said they landed just short of the border. Maj. Sharon Feingold, an Israeli army spokeswoman, said the rockets had been fired at an Israeli naval vessel patrolling Israeli territorial waters. In the tenuous political area, Sharon's coalition faced an immediate test Monday, with parliament to vote on several motions of no confidence. On paper, Sharon's coalition still controls 61 seats in the 120-member parliament. However, disgruntled lawmakers from the National Religious Party, a pro-settler faction in the coalition, and from Sharon's own Likud Party, said they might vote against the prime minister or abstain. Sharon was expected to survive the votes since his opponents are unlikely to muster the 61 votes required to bring down a prime minister. However, his situation remains tenuous. The NRP met Monday to discuss quitting the coalition, which would deprive Sharon of another six votes in parliament. In a boost for Sharon, the opposition Labor Party said it would not vote against him Monday, assuring his survival for now. Haim Ramon, a senior Labor lawmaker, hailed Sunday's approval of the Gaza plan as an "unprecedented historic move." He also indicated that Labor would be willing to join Sharon's government to help push the withdrawal plan forward. However, other Labor legislators oppose joining the coalition. Sharon's top aide, Dov Weisglass, indicated Sharon is ready to join forces with Labor, which led peace efforts in the past decade. "Even if the NRP decides to withdraw, the prime minister has a clear political alternative," Weisglass told Israel Army Radio. Under Sharon's disengagement plan, Israel will uproot all 21 settlements in Gaza and four West Bank settlements by the end of 2005. Sharon says a withdrawal boosts Israeli security and helps cement control of large blocs of West Bank settlements, where most settlers live. "Disengagement has begun," a beaming Sharon said after the Cabinet vote. "The government decided today that by the end of 2005, Israel will leave Gaza and four settlements in the West Bank." However, Cabinet opponents noted the compromise wording gives settlers and their backers plenty of time to scuttle the plan. Likud members defeated Sharon's disengagement proposal in a nonbinding party referendum May 2. The United States welcomed Sunday's vote, calling Sharon's plan a "courageous and historic step." It called on Israel to move forward with the plan as quickly as possible, in consultation with Egypt, Jordan and the Palestinians. Egypt, which borders Gaza, is preparing to play a central role in the withdrawal. Israel and Egypt are said to be very close to an agreement aimed at stopping weapons smuggling from Egypt to Palestinian militants in Gaza, reports CBS News Correspondent Robert Berger. Israel's foreign minister, Silvan Shalom, says that under the deal, Egypt would move more than 100 troops to the volatile border, which could facilitate an Israeli withdrawal from Gaza. Sharon's government seemed an unlikely candidate to be the first to remove settlements from Gaza and the West Bank. It is made up of parties with ideologies backing Israel's control over the territories and headed by the decades-long champion of the settlement movement — Sharon himself. Many remain skeptical, especially Palestinians, who want to establish a state in all of the West Bank and Gaza. On Monday, Palestinian Prime Minister Ahmed Qureia said the Israeli plan has been watered down so much it is now "meaningless." "At first they were speaking about settlements. Now they are ignoring the settlements," he said. "At first they were speaking about dates. Now there is no date."